Canal boat holidays in Central England cover the largest range of canal & river networks, including the Grand Union Canal mainline: one of the longest canals in the UK, the sleepy Droitwich Canals: re opened in 2011, and the notable Trent & Mersey Canal, which leads to the North of England waterways. Waterways weave through the Great British countryside offering waterfront pubs, fields of cattle and crops, and pretty villages. As you pass through these scenic areas on your hire boat, take advantage of your route to visit some of the many cities located in Central England including Warwick, Birmingham, Stoke on Trent, Leicester and Worcester, to name but a few. Click for more information on our city breaks by boat page. Each waterway has its own distinct feel and unique attractions, there is an experience to suit every boating party; if you are looking for a relaxing break through the Shropshire countryside, or a thrilling break into Birmingham with the family visiting Cadbury's World, you can find it here. A boating holiday in the Midlands offers the greatest selection of boating cruising rings for the experienced or energetic boater. Choose from the Warwickshire Ring, Black Country Ring, Avon Ring, Stourport Ring, Droitwich Mini Ring or the Four Counties Ring. Explore this page for all the information you will need to find the perfect boating holiday in Central England for your party. Gas Street Basin: Moor in the centre of Birmingham and step foot off your boat into the hub of its nightlife, with an abundance of bars and restaurants. Drayton Manor Theme Park: Take your party here to experience thrilling rides, roller coasters, and explore the wildlife in a zoo and farm area. Shakespeare's Home: Cruise into Stratford Upon Avon and be taken back in time to the poetic 16th Century, exploring his birthplace and his inspiration. Warwick Castle: Explore the magical castle, walking through the many luxurious halls and venture down into the dungeons. Cadbury's World: A childhood dream house! A family day out to explore this chocolate factory, see how chocolate is created and create your own. Tixall Wide: A widened section of the Staffordshire & Worcestershire Canal that offers breathtaking views looking onto the Manor House. Alton Towers: Family fun theme park and water park resort. For the thrill seekers take to the many rides or to relax by choosing to check in at the hotel spa. Foxton Locks & Inclined Plane Museum: Climb the two steep stair case locks of 5 each and take your hire boat to the top, where you can have a picnic. Blisworth Tunnel & Stoke Bruerne Canal Museum: Take your boat through the spooky tunnel, cruising for an hour to reach the light and the famous museum. Bratch Flight: Navigate these steep locks, opened in 1772 and most noted for its industrial heritage. Pass the historic pumping station. Britain's longest canal navigation, linking the industrial cities of London and Birmingham, cruising through countryside and through bundles of villages, market towns and cities. There are several 'arms' of the canal that extend to different sections of the UK navigations. The southern section of this mainline waterway connects to London City on the Paddington arm of the Grand Union Canal. and the River Thames at Brentford. Weedon. Braunston. Napton. Warwick. Stockton. Gayton. Quite a short canal linking the Grand Union to the River Nene found just after the famous Blisworth Tunnel. There is a flight of 14 locks to climb at Rothersthorpe before reaching Northampton City. The Northampton Arm connects the canal to the Fenland Waterways, leading onto the River Nene and city of Peterborough. This waterway provides a perfect opportunity to hire a traditional canal boat through Cambridgshire. Navigating the famous ten Foxton Locks, often bustling with hire boats, whilst the side ponds provide a haven for wildlife. The Leicester section of this waterway takes you to Market Harborough before making the climb to Leicester City. 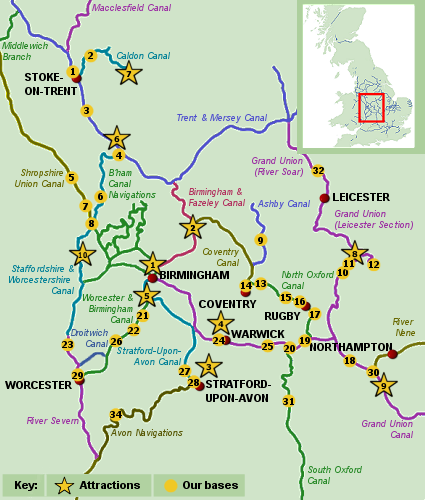 Just north of Leicester you cross onto the River Soar, eventually meeting the Trent & Mersey Canal near Nottingham. North Kilworth. Foxton. Market Harborough. Loughborough. Lined with forest views, there are a selection of impressive halls and gardens along this waterway leading down to Central Birmingham. Navigate a mixture of lock free canal as well as tackling the flight of 11 locks before entering Curdworth Tunnel and making your descent to the City. A collection of waterways navigating through Black Country views as well as the city experience of central Birmingham. Commonly referred to as the BCN, there are lots of waterways to navigate in and around with the centre at Gas Street Basin in Birmingham. Spanning from Worcester city centre, through the Tardebigge flight of 36 locks and up past Kings Norton Junction and to Bourneville, home of Cadbury's World. Cruising through rural woodland, peppered with the odd tunnel or two along the way, you come across Central Birmingham almost by surprise at Gas Street Basin. A popular place for boaters to moor as there is an abundance of bars, restaurants and clubs. Worcester. Stoke Prior. Tardebigge. Alvechurch. Navigate this picturesque canal under the stone built bridges, a relaxing navigation with not too many locks to navigate and plenty of local pubs and villages. After climbing three locks at Hillmorton you can choose a completely lock free route and venture onto the Ashby Canal or float past Coventry onto the Coventry Canal to operate the flight of 11 locks at Atherstone. South of Napton, the navigation changes to the South Oxford Canal, leading onto the Southern England waterways. Stretton-under-Fosse. Harborough Magna. Rugby. Clifton-On-Dunsmore. Connecting the Grand Union Canal to the South of England Canal navigations at Napton Junction. Cruise through Oxfordshire villages such as Cropredy and Banbury, full of countryside charm, with thatched cottages and fields of cattle. Starting from the historic market town of Stratford Upon Avon, navigate through the upper Avon Navigations; notice the widened waterways, deep locks and the abundance of wildlife amongst the reed beds. At Evesham cross onto the Lower Avon - a rural waterway that ends at Tewkesbury where the river meets the mighty Severn. Cruise up the Severn towards Worcester (additional licences may be required for this river). A scenery packed waterway with villages leading all the way to the end of the navigation where you can hop off your canal boat and take a trip to Alton Towers. This pretty waterway offers a tranquil escape, with not too many hire boats and an abundance of wildlife. 22 miles of tranquil canal, perfect for winter cruising and for those looking to experience a traditional canal boat holiday without needing to work any locks. A historic waterway where you can cruise alongside the site of the Battle of Bosworth, past towns and villages dating back to the Doomsday book and drift through forests. A picturesque canal with lots of character, there's a good selection of pubs with a scattering of locks along the way, this waterway is a perfect escape from the hustle and bustle of the city. Float along the waterway, stopping to work a lock or bridge before mooring for an afternoon cup of tea. Spanning from Stratford Upon Avon to Kings Norton Junction just south of Bournville. This waterway takes you through the heart of Shakespeare county. Passing through Lapworth Junction with a flight of 14 locks and over three iron aqueducts. A diverse canal with lots to experience. Climb the Cheshire locks up Heartbreak hill, take the Anderton Lift onto the River Weaver, or navigate through the historic home of the Potteries, 'Stoke on Trent'. Cruise through the historic Harecastle Tunnel and visit the country market at Stone. This waterway crosses onto the Northern England Canal navigations. Stoke on Trent. Great Haywood. Stone. Bordering the Welsh Canals, this rural canal stretches from Chester to Autherley. A perfect canal to escape the hustle and bustle of life and relax. The Shropshire Canal winds past some of the most picturesque villages and scenery, cruising though the rolling Shropshire countryside, as described by Enid Blyton in her children's novels, 'The Famous Five'. A wide open waterway with reed beds and plenty of wildlife. Passing Worcester travelling north and connecting to the Staffordshire & Worcestershire Canal at Stourport. The rivers generally are a lot wider in comparison to the canals, so very easy to navigate. The river is lined with forests, wild flowers and reed beds, providing a rich habitat for a variety of wildlife. A rural navigation that connects to the Trent & Mersey Canal. This canal is home to a diverse range of wildlife with picturesque views. Drayton Manor Theme Park is located off this canal, just north of the flight of 11 locks at Atherstone.